Hi everyone! I am back today to share a quick project with you all. I seem to be the go to gal for handmade invites lately and everyone from my church and all the school mums are giving me orders LOL it is overwhelming. Today I have some Bush Dance 40th birthday invitations to show you. 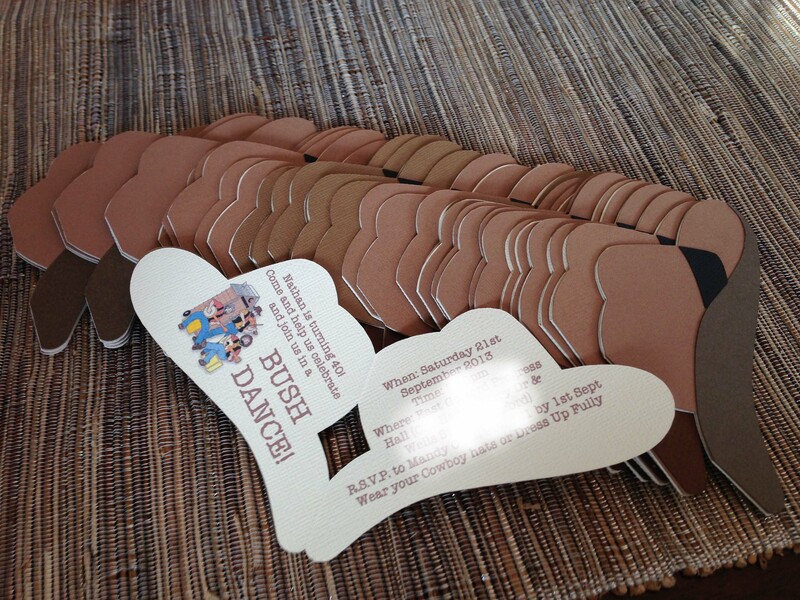 Ok so I wasn’t 100% sure what a bush dance was but trusty Google jogged my memory and I have come up with these akubra hat invitations using my Silhouette Cameo Machine. The cardstock that I have used is a variety of Bazzil, Kaisercraft & other brands as you can see, I did not have enough of the same colours so have varied them up a bit but I think they turned out great. That’s it from me today, I know such a sad little post but I will be back with more tomorrow but until next time, happy scrapping! They look great! Everyone will love them!